This was a busy week on the farm, with the fields finally drying up enough to get some major cultivation done. We started on the upper half of the fields, covering as much ground as possible in the time we had between more planting and harvesting, as usual. Staring down more rain this coming week, we decided that we had better complete the catchup on the cultivation before we were forced out of the field again. So we put the call out to our trusty crew and to the 300+ people who follow us on Facebook, promising a delicious lunch in exchange for three hours of hard labor. Our call was answered, and on Thursday morning, there were nine people, two horses, and a tractor in our two acres of vegetables. Before everyone showed up, we went through the field and made an improbably long list of things we would like to accomplish with our augmented field crew. Lo and behold, we crossed every single thing off that list by the time we stopped working for a generous portion or pulled pork, Asian cole slaw, and brownies with super-ripe strawberries. Danielle and I were in agreement that the extra time spent cooking, prepping, and organizing people more than paid off in how much we accomplished with so many people making a continuous concerted effort. Now the rains can come as they please and we won’t have to worry about huge weeds, and can focus on the fresh flush of weeds that will follow. This weekend, I attended a permaculture convergence put on by the Madison-area Permaculture Guild. Unfortunately, I had to skip the first night of the conference, which featured a potluck and a talk from the very inspiring Peter Allen of Savanna Gardens and Mastadon Valley Farm. Better late than never, of course, and when I arrived nice and early on Saturday morning, I was met with a very interesting, knowledgeable, enthusiastic, and friendly group of people. We ranged from people who had just encountered permaculture and were curious to learn more to experienced permaculture teachers to permaculture practitioners on urban lots to young farmers incorporating permaculture practices into their farm designs. Like all of the conferences and meet-ups I’ve attended, there was an undercurrent of excitement to be around people who shared some of the same interests and enthusiasms. Especially for the rural among us, it seemed like this feeling was coupled with a relief not to be the odd one in the neighborhood for a weekend. 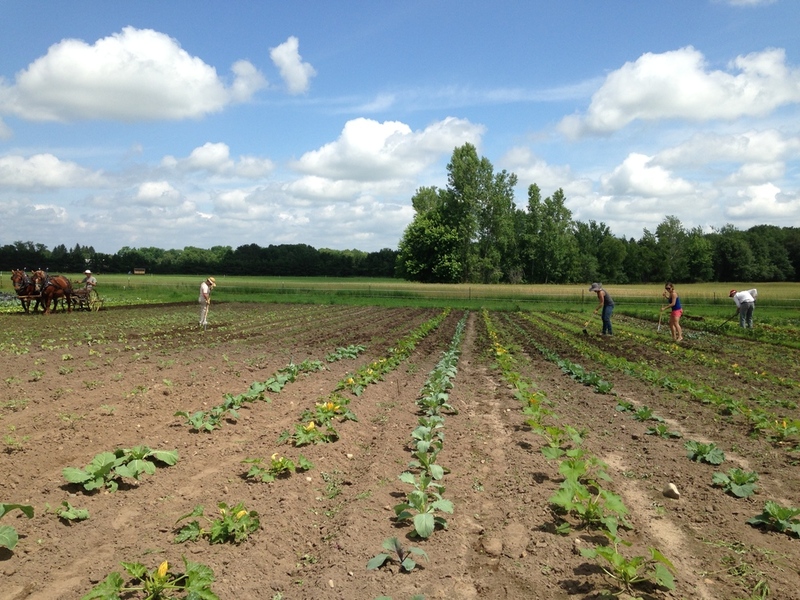 The convergence took place on a farmstead where permaculture practices have been incorporated, and where we were able to put some more into practice over the course of the weekend’s hands-on workshops. Most notably, the first workshop that I attended on Saturday morning involved mapping out a key line swale with a laser lever and watching as a backhoe dug the swale that we had envisioned. Keyline design started (like permaculture) in Australia, its goal being the non-erosive movement of water from valleys to ridges using a 1% downward sloping scale. My Saturday also included an edible and medicinal plant walk, led by a super-knowledgeable forager named Little John. In the afternoon, some of us went to visit a local farm that’s put lots of permaculture into practice. Strause family farm most notably grows wine and table grapes, but is also unique because it’s composed entirely of sand and limestone. In order to increase the organic matter and be able to grow anything, they invite the local crews to dump for free things like branches, wood chips, leaves, etc, which they use to construct massive Hugelkulture beds. The Strause farm looks like a very fun, interesting, and interactive never-ending project. Saturday afternoon and evening were rounded out with an organized large group discussion, a delicious local dinner, informal smaller discussions about any number of topics, a great musical performance, and a bonfire. Sunday, I started out my day with an early morning wet-booted walk around the meadows and forests of the farm, stopping to check how the new swale performed in the rain overnight. The first workshop I attended was with master tinkerer and idea man Greg David, who brought some examples of rocket stoves and highly efficient gassifiers he had fabricated. His talk was fascinating, and I’m intrigued by the possibility of using a rocket stove to heat greenhouse beds for starting seeds. The last workshop of the weekend was a talk on animal husbandry and forest management with grazing animals from a young couple who farm in Stoughton, WI. Emancipation Acres, among many other things, raises stock for other homesteaders and permaculture enthusiasts, focusing on small heritage breeds of pigs build to forage and grow slowly. They had some great tips on general stockmanship, plus some very interesting ideas on how to use animals in a longer-term plan to improve your land. Besides the workshops I attended, there were others going on at the same time where other attendees learned to make yogurt, construct a small aquaponics setup, design and install a pond, and improve damaged soils, among others. The workshops were all interesting and informative, but as usual it was the conversations with others that stood out as the unrepeatable magic of such a gathering. The weekend ended with promises to stay in touch, plans of visits to be made, resources to be shared, and a resounding affirmation that this “first annual” is definitely deserving of a second!